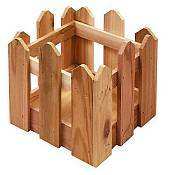 Cedar Picket Fence Planters will be a delightful addition to any patio or garden area. Even if you only have a small patio, you'll find room for your own little garden with this charming picket fence planter. These planters are perfect for people with limited space, or for apartment and condo dwellers who enjoy growing their own flowers, herbs, and vegetables. Picket Fence Planters come fully assembled and are made of Western Red Cedar, which will turn a lovely ash colored gray if left to the elements unprotected. To maintain the pinkish red color of cedar, use a clear, oil based water seal. You will get years of enjoyment from these planters because Cedar is naturally insect and weather resistant. Available in two sizes: 7 3/4" x 7 3/4" x 7"H and 18"L x 7 3/4"W x 7"H.